Four students took a meaningful and fulfilling winter-break trip they’ll never forget. Christina Ou, Cathy Fang, Melina Driscoll and Ashley Burbano, members of Carnegie Mellon University’s Engineers Without Borders (EWB), traveled to Nyadire, Zimbabwe, where they spent two weeks at the town’s United Methodist Centre helping the small community of about 2,000 people. Their trip was two-fold: they followed up on their chapter’s four-year solar street light project and began a new effort to improve the cooking system for a local school. Fang and her classmates monitored, evaluated and gathered feedback on the 24 solar street lights installed in September 2017 along the main road of Nyadire. Based on years of research and community feedback, the solar system was determined to be an efficient way to light the resource-strapped neighborhood, where the electric grid is very unreliable. 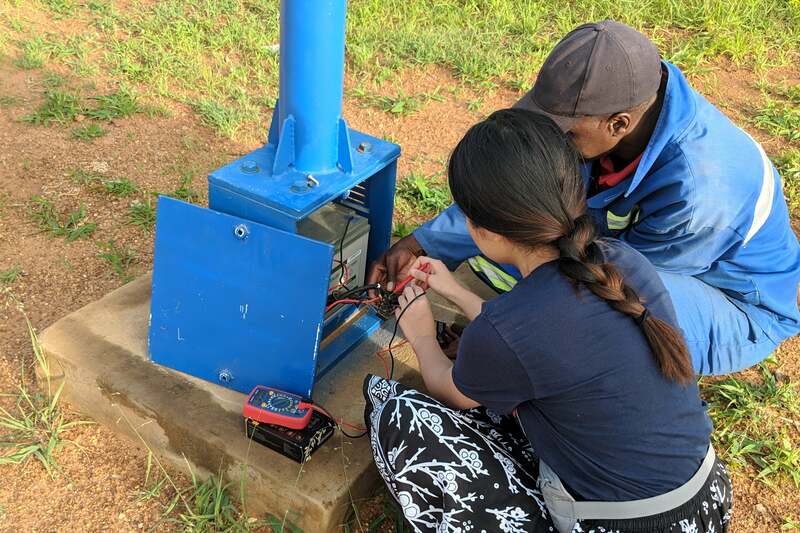 Cathy Fang and Dennias Chivi of the Nyadire maintenance team check the battery in a solar street light. Ou, a senior electrical and computer engineering major, said CMU’s EWB chapter led fundraising efforts to pay for 95 percent of the installation cost of more than $40,000. The community will be responsible for covering the maintenance costs moving forward. Feedback from the community has been positive. “We were told when the electricity is out, students will sit under the lights to do their homework,” Fang said. 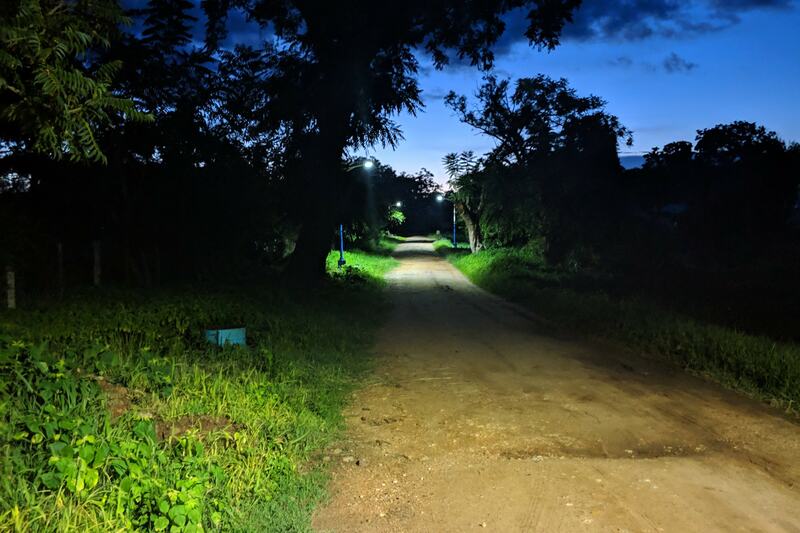 Solar street lights illuminate one of the main pathways in Nyadire. Burning firewood in an oil-lined concrete pot is the current heat source for cooking at the Nyadire Primary School, which has an enrollment of about 150 boarding students and more than 450 day-school students. Firewood is expensive and scarce in Nyadire, which is trying to preserve its forests. 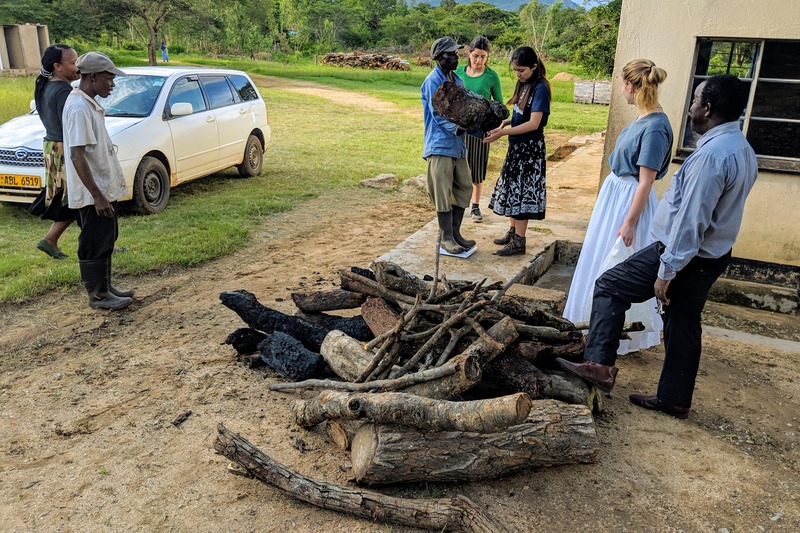 The students discovered it takes a large amount of firewood to cook for the students each day and securing the wood is labor intensive. Propane gas and ethanol gel were identified as alternatives to firewood, but the students have found that a biogas system is the frontrunner at this point. The EWB team and school kitchen staff weigh the amount of firewood used daily to determine the appropriate size of a new cooking system. Driscoll, a sophomore information systems major, said the biogas system would use an underground digester, or mixer, that biodegrades human waste, animal waste and food waste. The biodegradable waste releases methane gas, which is fed through a pipe into the stoves. “Part of our data collection was calculating how much waste was available to make sure there would be enough waste to produce enough gas to cook every day,” Driscoll said. Driscoll said there are cows and chickens at a local farm that could supply much of the waste, but they’re still weighing options. Ou (far left), Burbano (center), Driscoll (third from right) and Fang (second from right) worked with the school's kitchen staff, teachers and school headmaster Tendai Mushapaidze (far right). Implementing a new cooking system is not just an engineering problem, it’s a social problem, too, the students said. “Manually feeding waste into a digester is really messy. It’s not a fun job. We have to make sure the people are willing to do that. Will they be able to sustain the system? We have to take all these factors into consideration,” Ou said. Back in Pittsburgh, the four students are now working on drafting a proposal for the biogas system to submit to the national EWB chapter. If that’s approved, specifications for implementation must be crafted, submitted and accepted before another trip to Nyadire is made. While a new team of students will carry the torch forward, this team is grateful to have had the opportunity to impact the lives of others. Ou, a four-year member of EWB, said her experience has been rewarding. “I really like Engineers Without Borders because it’s a practical way to apply my learning as an engineer and an opportunity to solve a real-world problem, impact real people and benefit an actual community,” Ou said. Evan Schindewolf, a senior physics major who was part of the solar lights team but did not make this most recent trip, said he “learned so much” from his work in EWB. “I joined EWB because I wanted to work with people from other cultures, learn the engineering process and make an impact. It’s been super valuable to be a member of EWB,” he said. 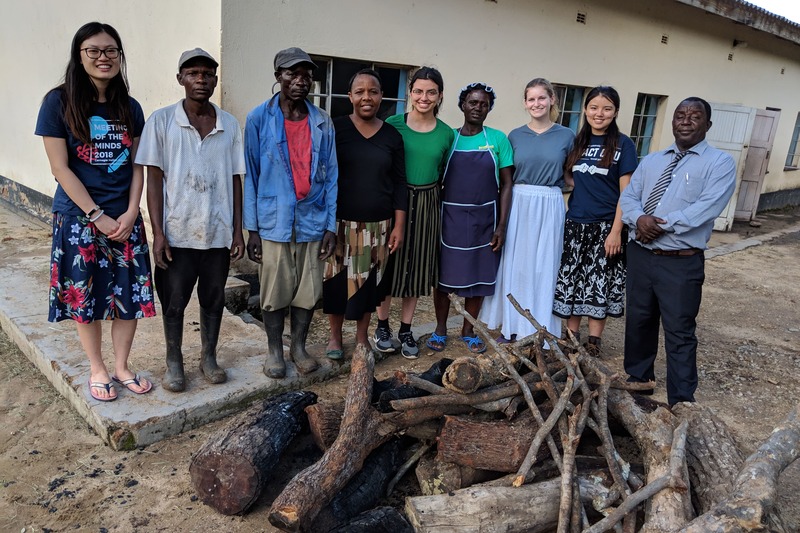 Christina Ou, Cathy Fang, Ashley Burbano and Melina Driscoll took a winter-break trip to Nayadire, Zimbabwe, where they followed up on a solar street light project and began an effort to impove a local school's cooking system. The Carnegie Mellon University chapter of the nonprofit humanitarian organization Engineers Without Borders is a group of students dedicated to understanding the challenges that face humanity, and creating socially conscious and environmentally sustainable technologies to improve quality of life for local, national and international communities.